Erase Your Criminal Record Today For FREE! Criminal records hold back millions of people every year. The process to get rid of that record is called "Expungement". Type in your case number or "Example" below to get started. So far MDExpungement.com has been used to print 84,946 petitions and has saved Maryland residents $1,905,900 in Court filing fees! 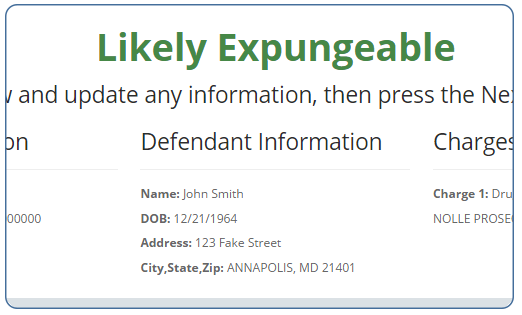 Download our new expungement tool which allows you to expunge records directly in Maryland's Judiciary Case Search. Click here for more information. This website does not determine JRA expungement eligibility. By clicking the "Expunge" Button you agree to the Terms and Conditions. If you are an attorney sign in above or click here to make a free account. To find your case number please visit the Maryland Public Case Search website. THIS IS NOT A LEGAL SERVICE, WE DO NOT GIVE OUT LEGAL ADVICE, AND WE ARE NOT YOUR ATTORNEY. Expunge Directly In Case Search! Our new tool allows you to expunge cases and determine eligibility directly in Maryland's Judiciary Case Search. This is done through the use of a Chrome Extension. The tool is free and can be downloaded on Google's Chrome Extension Store. It is designed for attorneys and intake staff who need to frequently lookup or expunge criminal records. If you are someone looking to expunge your own record, please ues this website and not this new tool. After installing the Chrome Extension, simply navigate on Maryland's Judiciary Case Search to the case you want to expunge. Click the new blue Mdexpungement button on the top right of your Chrome Browser. That will bring up a little window, explaining whether the case is likely eligible or not. Click "Add Case" and click print to print all the forms you need. You can add as many cases as you would like. The new tool will also add the tracking number of the case to the results page as well as changing the color of the case numbers you've already looked at to the color of their eligibility. This allows you to easily find other related cases (through the tracking number) as well as being able to identify the cases you've already looked at. To learn more, click on the video to the right. The Young Lawyers Section of the MSBA have partnered up with the Maryland Volunteer Lawyers Service to create new training videos in virtual reality. They are filmed with a 360 degree camera allowing the user to put on a virtual reality headset and be "in" the courtroom watching a hearing take place. For expungement they create two videos. The first is what to do if your petition is objected to by the State's Attorney because there is no evidence of Marijuana amount. The second video is what to do if you are attempting to expunge your record early for "good cause". Click on the videos below and use your mouse to drag the screen around. See all the 360 videos by clicking here. These videos do not constitute legal advice. If you don't know your case number you can find it on the the Maryland Public Case Search website. If you just want to see how it works type "Example" as the case number. Your case will be instantly pulled from the Maryland Case Search Website. If your case is expungeable you will have the ability to update any outdated information. Print, sign, and file the forms with the Courthouse. An expungement is the destruction or removal from public view of a criminal record. Once expunged your record will be removed from Maryland public databases and background searches. Expungement law has many nuances and exceptions but in general, every case EXCEPT ones in which you were found Guilty are expungeable. Certain dispositions like STET and Probation Before Judgement (PBJ) have minimum waiting periods before you can file for expungement. To learn more about expungement law click here. Cases in which you were formally charged, except for certain traffic cases, are not automatically expunged. In order to get an expungement you must formally ask the court to expunge your record. A majority of all criminal cases each year are expungeable. Baltimore City District Courts in 2014 had an expungeable case rate of about 72%. If we use that same rate for all the cases in Maryland it means there were 121,414 expungeable cases created in 2014! Despite all the beneficial reasons to get an expungement, we are still creating more expungeable cases then we are expunging. In 2014 the Baltimore City District Court produced about 19,409 expungeable cases. However, there were only 6,606 expungement petitions filed in Baltimore City District Court. To learn more about expungement statistics click here. Employers will discriminate against people with criminal records. Especially when the charge is a theft or drug charge. Most university's require applicants to disclose prior criminal history. After your record has been expunged you do not have to disclose it. Most landlords will look up a persons record before renting to them. Having a record can even hurt your ability to get credit. We are always happy to give interviews for reporters. Please contact us at contact@mdexpungement.com. Matthew Stubenberg, creator of MDExpungement.com testified on behalf of several bills being proposed to the Maryland legislature. His testimony starts at 1:45. Matthew Stubenberg is interviewed at the October 1st 2015 New Pslamist expungement event. Accounts are free let you use the bulk feature. Expunging your record is free with MDExpungement. See the Terms and Conditions for additional details. The Court charges a $30 filing fee for each expungement petition (each case), unless your disposition was a Not Guilty. If you received a Not Guilty there is no filing fee. *This is an automated service and we cannot guarantee the results of any predicted outcome. We always love to hear of ways we can improve our service. Automatic record expungement was the idea of Matthew Stubenberg, Esq. the President of Maryland Legal Apps, LLC. The website creates a simple and efficient way to determine the expungability of a case and to automatically fill out the necessary forms. Matthew Stubenberg is now the IT Director at the Maryland Volunteer Lawyers Service. A special thanks to Phil Smith for programming assistance and Mary-Denise Davis with the Office of the Public Defender. You agree to allow MDLegalApps, LLC to access the Maryland Case Search website on your behalf to collect information relating to your case. In Maryland, laws exist to ensure that state government is open and that the public has access to appropriate records and information in its possession. At the same time, both state and federal laws provide exceptions that serve various needs, including the privacy of individuals. While much information is made available to the public through this site, some information may be restricted or require registration to obtain. All of the information collected at this site becomes a public record that may be subject to inspection and copying by members of the public, unless an exemption in law exists. The information available through the Maryland Judiciary Case Search (MDJCS) database may be limited in SCOPE (extent of information available), HISTORY (years of available information), TIME (how quickly information is updated), and RELIABILITY (general accuracy of information). I. Scope of Information Information is available on all civil, traffic, and criminal cases in the state. This information includes defendant name, city and state, case number, date of birth, plaintiff name (civil cases only), trial date, charge, and case disposition. II. Historical Information All information contained in the MDJCS database originates in the individual counties where the case is filed, and is available for the period that each county has maintained an automated case management system. The amount of historical information may vary by county based on when an automated case management system was deployed in that county and how the system has evolved. III. Timeliness of Information MDJCS case data is updated regularly, with these limitations: i. Information originating or maintained within the Circuit Courts and District Courts of all Maryland counties, is available at the approximate time that it is entered in the records of the court. IV. Reliability of Information This site reflects the electronic record of the cases presented and may not always reflect the information maintained within the official case file. The data may not be reliable in the sense that further action may occur in the case that would affect the record. If you believe information provided is inaccurate, please send written notice to the court where the original record was created or filed. For courthouse locations and contact information, please visit: Circuit Court Locations: http://mdcourts.gov/circuit/directory.html District Court Locations: http://mdcourts.gov/district/directories/courtmap.html Note: Requests for corrections will not be accepted by telephone. The Maryland Judiciary, its agencies, officers, or employees do not guarantee the accuracy, reliability or timeliness of any information contained in this system. Users rely on this information at their own risk. This license shall automatically terminate if you violate any of these restrictions and may be terminated by MDLegalApps, LLC at any time. Upon terminating your viewing of these materials or upon the termination of this license, you must destroy any downloaded materials in your possession whether in electronic or printed format. The materials on MDLegalApps's web site are provided "as is". MDLegalApps, LLC makes no warranties, expressed or implied, and hereby disclaims and negates all other warranties, including without limitation, implied warranties or conditions of merchantability, fitness for a particular purpose, or non-infringement of intellectual property or other violation of rights. Further, MDLegalApps, LLC does not warrant or make any representations concerning the accuracy, likely results, or reliability of the use of the materials on its Internet web site or otherwise relating to such materials or on any sites linked to this site. By using the site in any manner you agree not to hold MDLegalApps's, LLC or any member of MDLegalApp's, LLC liable for any determination of expungability or any form obtained from this site. You agree to make all decisions based on expungability by your own legal determination. This tool should not be relied on as an attorney but merely as a time saving aid. Reviewing legal forms with an attorney before filing is always advised. A record of all cases searched and the case information therein is saved on our servers to improve reliability. This site is not and should not be used as an attorney. Any information given is not legal advice and should not be relied on as legal advice. In no event shall MDLegalApps, LLC or its suppliers be liable for any damages (including, without limitation, damages for loss of data or profit, or due to business interruption,) arising out of the use or inability to use the materials on MDLegalApps's Internet site, even if MDLegalApps, LLC or a MDLegalApps, LLC authorized representative has been notified orally or in writing of the possibility of such damage. Because some jurisdictions do not allow limitations on implied warranties, or limitations of liability for consequential or incidental damages, these limitations may not apply to you. The materials appearing on MDLegalApps's web site could include technical, typographical, or photographic errors. MDLegalApps, LLC does not warrant that any of the materials on its web site are accurate, complete, or current. MDLegalApps, LLC may make changes to the materials contained on its web site at any time without notice. MDLegalApps, LLC does not, however, make any commitment to update the materials. MDLegalApps, LLC has not reviewed all of the sites linked to its Internet web site and is not responsible for the contents of any such linked site. The inclusion of any link does not imply endorsement by MDLegalApps, LLC of the site. Use of any such linked web site is at the user's own risk. Any claim relating to MDLegalApps's web site shall be governed by the laws of the State of Maryland without regard to its conflict of law provisions. This warranty only applies to single case purchases. Not to any account holders. The warranty will refund the $9.99 purchase price if your expungement petition is rejected by the Courts. In order to qualify for a refund, the website www.mdexpungement.com must have given the result of "Likely Expungeable". The purchaser must have also followed instructions regarding where and how to file. The warranty does not extend to rejections by the Court for errors made by the Purchaser (i.e. failing to pay the court filing fee or failing to file properly). The warranty also does not extend to rejections by the Court made for a reason not related to the particular case. For instance, if the purchaser has a pending criminal matter, the purchaser cannot file any expungement petitions. We warn the purchaser of potential reasons your petition may be rejected that are outside of our control on the download page. Once the forms for a case are purchased, they will be available to reprint for as long as the case is accessible on the Maryland Case Search website. Once the case is removed from case search, our system will not be able to reach it, and therefore cannot reprint the forms. All users of the site release forever MDLegalApps, LLC. and any employees of MDLegalApps, LLC. from any legal actions relating to your expungement. It is impossible for this program to analyze whether there will be any ancillary detrimental effects to expungement. All visitors of the site are responsible for reviewing their own situation and making the decision to go forward with expungement. If you have any questions as to whether expungement is right for you, please contact an attorney before filing your petitions. We reserve the right to change the terms and conditions at any time. It is necessary to check the version number of the terms and conditions, each time you visit the site to see if content has changed. We do not and cannot provide legal representation to ANY user of the site. We are not your attorney and all output from this site is generated by a computer program without being analyzed by an attorney. At no point is an attorney-client relationship formed between any user of the site and any member of MDLegalApps, LLC. Always review the information generated by this website and only use the information generated by this website if you have independently concluded the information is correct. We may from time to time email you about updates to the website, expungement related news, volunteer/pro-bono opportunities, specific problems related to a case you searched if there was an error, and funding requests. Data scraping or any automated way to pull information from this site is prohibited and a violation of the terms of service. We do have an API for certain users. If you are interested please contact us at contact@mdexpungement.com. You MUST be an attorney, a paralegal, a law clerk, or a law student in order to create either account. MDLegalApps reserves the right to change, modify, or remove features from the regular free accounts at will and without notice. Only 1 person is authorized to use each regular account. Each user must have thier own account. The account may not be shared and doing so violates these terms and conditions and could result in cancellation of your account and potential legal action. Upgrading from a regular account to a pro account entitles the user to the features listed on the account page under pro account features. Excluding the features marked as "Coming Soon". MDLegalApps will attempt to keep services running smoothly. However, some features may have to be taken offline for fixing or modification. This may include modifications in features. If you choose to cancel your pro account you will not be pro-rated for the remaining time left on your subscription. Only 1 person is authorized to use the Pro-Account. Each user must have their own account. The account may not be shared and doing so violates these terms and conditions and could result in cancellation of your account and potential legal action. If you volunteer with Maryland Volunteer Lawyers Service (MVLS) by taking expungement cases pro-bono you may be eligible for a free upgraded account. Volunteering does not guarantee an upgraded account and all decisions to upgrade are made on an individual basis. Upgraded accounts are not indefinate and length of upgraded accounts may vary. MDLegalApps reserves the right to downgrade any free upgraded account at any time without notice. For more information contact us at contact@mdexpungement.com. There are limitations to the search features. The name search feature and tracking number search feature can only check against cases collected by the website. Currently, only Baltimore City and Baltimore County are checked against. This collection is also limited to District and Circuit Court cases, not traffic or other civil cases. While we make the best attempt to collect all the cases in our database, there may have been some that were missed due to error. Therefore, the results from the name search or tracking number search should never be treated as 100% accurate. You should always do you own searches and come to your own conclusions. We keep a copy of every form created using the site. This is done for quality assurance purposes. 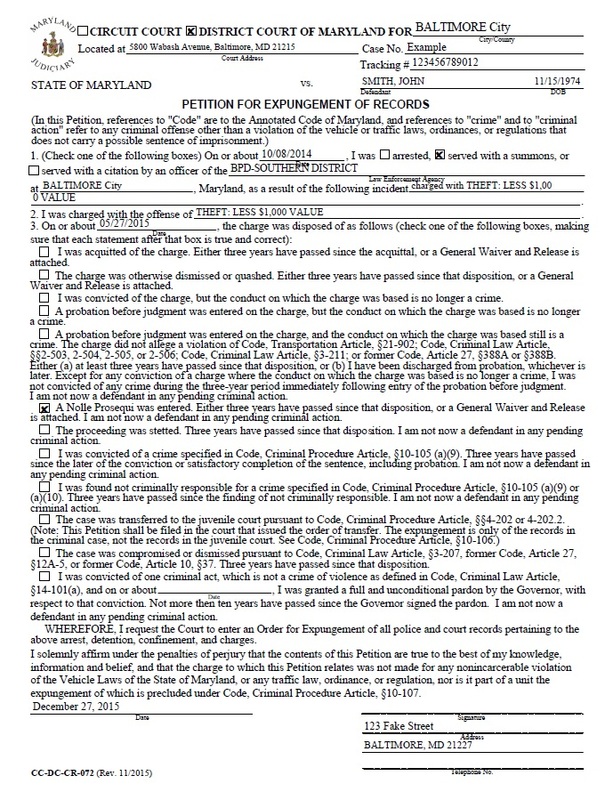 A defendant may petition for expungement if a guilty verdict was entered for a specified public nuisance crime under Criminal Procedure 10-105 (a)(9) and at least three years have passed since the conviction or satisfactory completion of probation, whichever is later, and is not now a defendant in a pending criminal action. (ix) Except for carrying or possessing an explosive, acid, concealed weapon, or other dangerous article as provided in § 7-705(b)(6) of the Transportation Article, any of the acts specified in 7-705 of the Transportation Article.